With a selection of secluded sandy beaches, historic pirate coves, boulder-spattered shores, and colorful tropical reefs, the British Virgin Islands (BVI) are the epitome of a pristine and paradisiacal Caribbean destination. The BVI has more than 50 islands, but most of its activities are concentrated on four main islands: Tortola, Virgin Gorda, Anegada, and Joost Van Dyke. Here’s what you can do and experience in these four beautiful Caribbean islands and surrounding cayes. 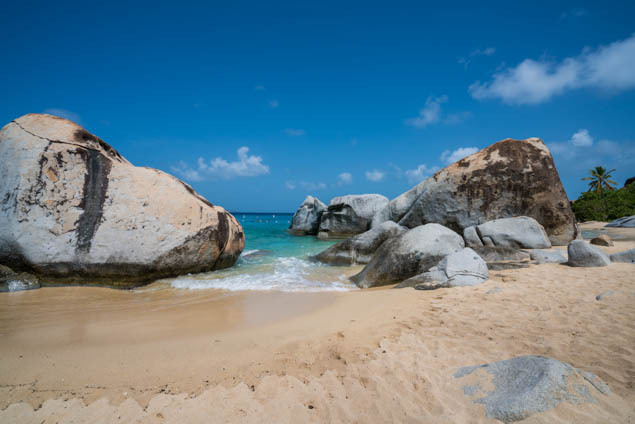 I’ll start with the iconic “must-do” beach in all of the BVI –The Baths– located in Virgin Gorda. This gorgeous boulder-filled beach is accessed through a labyrinth of winding tunnels and grottoes created by giant granite boulders spattered all over the beach. Roam around and explore the many routes created by the colossal granite stones. Find hidden spots where you can shelter yourself from the sun or feel like you found your own private spot at the beach. As if the scenic view isn’t enough, the warm crystalline water makes this one of the best beaches you can experience in the whole world. The Baths, which is now a National Park, is a great snorkeling beach for families since most of its shore is protected from waves by its natural reefs and corals. Nature photographers and wildlife enthusiasts will also find The Baths a place worth visiting. Road Town, the capital of the BVI, located in Tortola, is a picturesque small town full of yachts and fishing boats on its natural harbor, and hundreds of houses peppering the side of its lush, green mountains. Walk along Main Street to see its small scale, concrete and wooden colonial architecture and discover its history and heritage. Visit the old HM Prison, which is filled with countless stories shared by its paint-cracked walls and structure. Don’t miss the colonial Post Office with its well-preserved arched front. As you walk along the waterfront, take your time to enjoy some of BVI’s delicious Caribbean snacks and local dishes in one of its many shacks and restaurants. Take your snorkel gear and head to Smuggler’s Cove in Tortola, a secluded beach that still looks as if pirate ships full of riches could dock there to hide their treasures. Unlike many beaches in Tortola, Smuggler’s Cove isn’t overrun with beach bars and condos. Dip in the crystalline tropical waters and snorkel your way across the Lower Belmont Bay. Or, relax on its unspoiled white sandy shore. Anegada’s geology contrasts with the rest of the BVI in a very curious way. Instead of mountains, granite boulders, and volcanic topography; Anegada was created by corals millions of years ago. Due to this formation, it barely rises 30 feet above sea level, giving it a very flat appearance. But, thanks to its coral origins, Anegada has some of the most interesting and diverse reefs in the BVI – Among them, Horseshoe Reef. These reefs are also home to dozens of shipwrecks you can either snorkel or dive in. If fishing is your thing, you can catch some of the freshest lobsters in all of the BVI around these reefs. With a height of 1,344 feet above sea level, the Gorda Peak is the highest point in Virgin Gorda. Hike one of the two trails that weave to the lookout points on the top. Along the way, you’ll experience the diverse geography of this island as you pass through both dry woods areas as well as moist rainforest spots. Gorda Peak has some of the best trekking you can do in all of BVI, with views that stretch to Tortola, wildlife that includes hummingbirds as well as other local birds, and flora that ranges from pineapple trees, orchids, and cacti. The Rhone National Maritime Park is probably one of the most curious national parks in the BVI. Back in 1867, the RMS Rhone, a Royal Mail ship, was battered by a storm and wrecked on the coral bed. Since it sank, its hull has been covered with seaweed and sponges, becoming a home to a plethora of marine life. It was in 1980 that the whole area became a protected reserve, making it one of the best places in the Caribbean for SCUBA diving and shipwreck diving.